Merchants & Marauders lets you live the life of an influential merchant or a dreaded pirate in the Caribbean during the Golden Age of Piracy. Seek your fortune through trade, rumour hunting, missions, and of course, plundering. Will your captain gain eternal glory and immense wealth - or find his wet grave under the stormy surface of the Caribbean Sea? Well starting with the Box and components: the artwork and quality of the pieces for this game are excellent dripping with theme. The cards are of good quality stock, the miniatures well made and impressive to look at, each player gets a treasure chest to stash their horde as well as a useful player board to store their items on. The cargo cards are used both for Cargo and during some combats which is a really neat mechanic. The rules are not overly complicated and relatively easy to pick up. Combat is handled well and not to be undertaken lightly by new captains fresh out of port. Captains picked by players at the start each have different strengths and weaknesses in the core skills, each Captain also has a special ability all of which may influence whether they run as a Merchant or Pirate. Even if you start the game as a Merchant temptation may come you way as the game progresses to go after that fully laden pirate ship to gain that last bit of glory to win the game. This is not a short game but it is very enjoyable, the theme is built into every aspect of the game and you can\'t help but get caught up in it all. Each event, rumour and glory card just adds to the atmosphere of the game with you playing to the strengths of you chosen Ship/Captain combo. Excellent game with lots of replayability, a worthy addition to my collection and one I will be playing again. This is the latest in a long line of pirate games and is, in my opinion, one of the best yet. 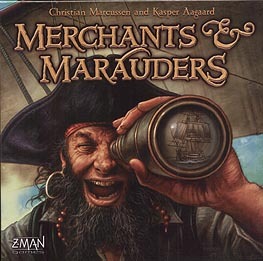 You start out as either a merchant trading goods between ports or as a pirate hunting merchant ships for their wealth. Whichever path you choose, the objective is the same - you have to be the first player to obtain 10 Glory points and there are several ways you can gain them. Before going onto the gameplay, let me say that the components of the game are first class. The ship miniatures are really well done and are nicely detailed. The board is a beautifully illustrated map of the Carribean and the card decks are also well illustrated, of which there are several for Missions, Rumors, Glory, Ships, Captains, Events and Cargo. Each turn follows the same order. Firstly, an Event is drawn and read aloud which either affects that round in some way, such as storms at sea, or stays in effect for several rounds, such as the appearance of a Naval or Pirate ship. Then each player in turn has three actions, which can be Moving, Scouting or a Port action. Moving is from one sea area to another, while scouting is trying to find another ship in the area you are in. Port actions are sub divided into several other actions, all of which can be performed if you wish and in any order. These let you buy or sell goods, visit the shipyard for repairs or upgrades, look for rumors or resolve missions and recruit more crew. Combat will occur from time to time, whether it\'s you hunting down merchants or the naval ships hunting you down and there is a wonderful game system that has these non-payer ships come hunting you out, especially if you have a bounty or in the case of pirates, if you are carrying gold or cargo. Combat is a very straightforward affair. You can choose to either shoot, board or flee which involves rolling the special dice, success being the rolling of skulls. The game is just dripping in theme, is beautifully streamlined and a joy to play. You really care about what happens to your captain. If he dies, you are not eliminated however, you just choose a new captain and start over. This is quite simply one of the best pirate themed games yet created!